The October 2012 issue of StarStudio magazine is in special back-to-back cover. On one cover features the Star Magic Ball 2012 and on the other cover features Maja Salvador where she shares her home sweet home. 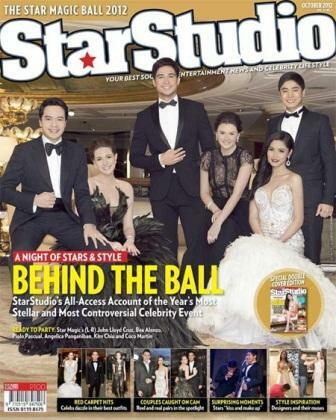 On the Star Magic Ball 2012 cover, it features the six of the hottest Star Magic artists namely Piolo Pascual, John Lloyd Cruz, Bea Alonzo, Angelica Panganiban, Kim Chiu, and Coco Martin! Meanwhile on the other cover, Maja Salvador leads the exclusive home special. Cool!